A screenshot from the Topman website before it was removed. FASHION RETAILER TOPMAN is at the centre of controversy after it was accused of selling a t-shirt which many thought referenced the Hillsborough disaster. 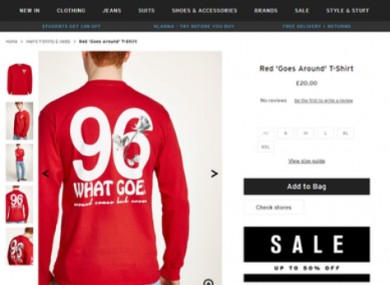 The red and white top features a large number 96 with the words “what goes around comes back around” and “karma” written on it. Many people, including an MP, have called for the item to be removed from Topman’s online catalogue. A search for the t-shirt this morning returned no results. Labour MP for Wirral South, Alison McGovern, tweeted the company about the t-shirt. She wrote: “Hi @Topman. No idea what is behind this, but it is very unfortunate. Hope you can discontinue the tshirt asap please.” McGovern’s brother was one of the 96 people who died in the 1989 tragedy. There is no suggestion that the company deliberately referenced the disaster. Some people are standing up for the company and said that the t-shirt could be referencing a Bob Marley album called What Goes Around Comes Around which was released in 1996. Email “Topman 'unreservedly apologises' after claims it was selling t-shirt referencing Hillsborough disaster”. Feedback on “Topman 'unreservedly apologises' after claims it was selling t-shirt referencing Hillsborough disaster”.